This year's women's lacrosse squad features seven pairs of high school teammates. It is a bleak Wednesday at Jordan Field as Harvard women’s lacrosse takes on Boston University, and snow piles a foot high beyond the end line, one last lingering gift from a frigid February. The score is 2-2, and sophomore midfielder Tessa Queri pivots back towards the center of the field as freshman midfielder Grace Hulslander approaches. Queri deftly flips the ball to an accelerating Hulslander and curls across her path, forcing Hulslander’s defender to duck underneath the overlap. Suddenly, Hulslander breaks her momentum and feints back towards Queri, who stiffens as if preparing to receive the pass. Hulslander’s defender hesitates only for a moment, but it’s enough; she has a step on her opponent now. Queri looks on in satisfaction as her teammate pulls back and fires a rocket into the top corner to put Harvard ahead. It’s technically an unassisted goal, but the duo’s chemistry is unmistakable. And it’s not surprising. They went to preschool together. They also went to the same elementary school, middle school, and high school. In fact, there are seven pairs of high school teammates on the women’s lacrosse team this year. They are: Camerin Rawson and Keeley MacAfee; Charlotte Clark and Shea Jenkins; Tessa Queri and Grace Hulslander; Olivia Gill and Julia DiNovi; Celia Concannon and Katie Muldoon; Marley Jenkins and Emily Ryan; and Kristin Burnetta and Hannah Keating. We sat down with a few of them to discuss what it’s like to take the field with old friends. On the field, Tessa Queri and Grace Hulslander helped carry Christian Brothers Academy to new heights in their four years at the school. Christian Brothers has long boasted an impressive athletics culture; it has produced multiple NFL players, an NBA forward, and a number of standout college athletes. Still, the 2016 campaign was one to remember. Off the field, the two were essentially inseparable. The pair met in preschool when they were three years old, and attended school together for more than a decade before they arrived at Christian Brothers, a small private school in Syracuse, N.Y. Apparently, they share not only TV preferences but also TV passwords. “Grace loves Friends so much that she has her own account on my Netflix that she would use at my house so that she could watch TV—her own TV—and it wouldn’t interfere with the settings,” Queri said. Hulslander (pictured) and Queri have paired up again in college to form a potent duo. It is evident, just from talking to the pair, that they are constantly on the same wavelength. During the Crimson’s interview, conducted over the phone while Queri and Hulslander were on a bus to an away showdown with No. 15 Princeton, a teammate in the background asked what they were doing. Queri and Hulslander replied, in comically perfect unison, “We’re doing an interview,” and returned to the call. That bond, according to the pair, has helped them perform at high levels on the turf. It’s not inaccurate to say that Hulslander wouldn’t even be here without the older Queri. During the recruiting process, Grace counted her friend’s presence as an important factor in deciding to take her talents to Harvard. At this point, both players broke into laughter. If the strength of their friendship is any indication, they are poised to continue their high school success in college for years to come. Sophomore midfielder Celia Concannon and junior midfielder Katie Muldoon, just like their teammates from Syracuse, propelled Garden City High School to a state title during their time at the school. Both players hail from Garden City, the town, and they were each named senior captain in their last season in high school. They played on the varsity team together and were both four-year letterwinners. “I’ve known Katie since we were both little and we became good friends in high school when we were playing on the same team,” Concannon said. Garden City snagged a state championship in Muldoon’s senior year (Concannon’s junior year). Ten of the seniors on that roster, including Muldoon, went on to play Division I lacrosse. The Long Island natives are delighted to be joining forces again at Harvard. They know each other’s music tastes (Celia’s favorite musician is Billy Joel) and TV habits (Katie doesn’t watch, which Celia finds “bizarre”), and they’re close off the field. 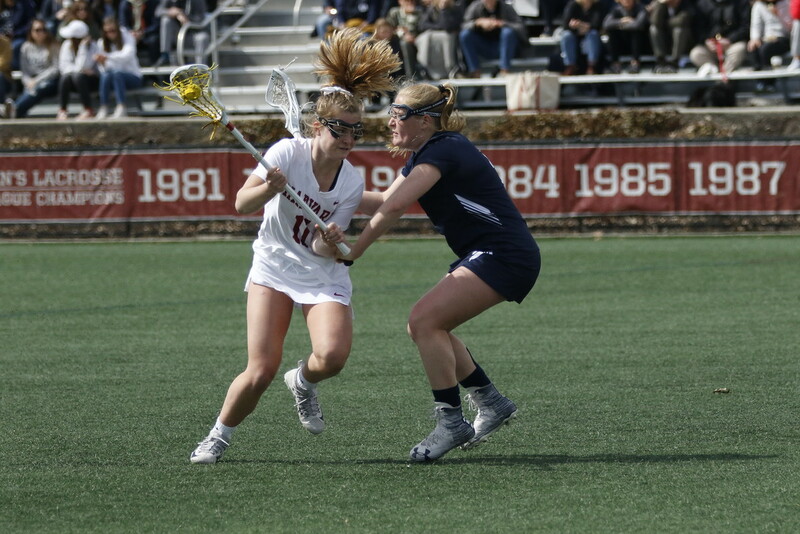 Junior midfielder Katie Muldoon has been a stalwart in the Crimson lineup since her freshman year. Muldoon feels the same way. She pointed out that having a high school teammate at Harvard is like taking a small slice of Garden City to Cambridge. Concannon and Muldoon agree that hailing from the same hometown and high school has competitive advantages. There is, of course, intangible chemistry to be considered, but there are also tactical benefits to playing with an old friend. Communication becomes easier, according to this pair. And, as if they didn’t know each other well enough already, their mothers are also very close. Junior midfielder Kristin Burnetta and junior attacker Hannah Keating have known each other for twelve years. They have been on all the same soccer and lacrosse teams since fourth grade, including the Under Armour All-American team with the best players in the country in the summer before freshman year. They both attended the Agnes Irwin School, a small private school near Philadelphia whose founder happened to be the first dean of Radcliffe College, Harvard’s former sister institution. The school doesn’t have a particularly show-stopping athletic program, according to Burnetta and Keating, but occasionally one class or another comes along with a number of gifted athletes. Burnetta and Keating’s grade dominated soccer and lacrosse for four years. 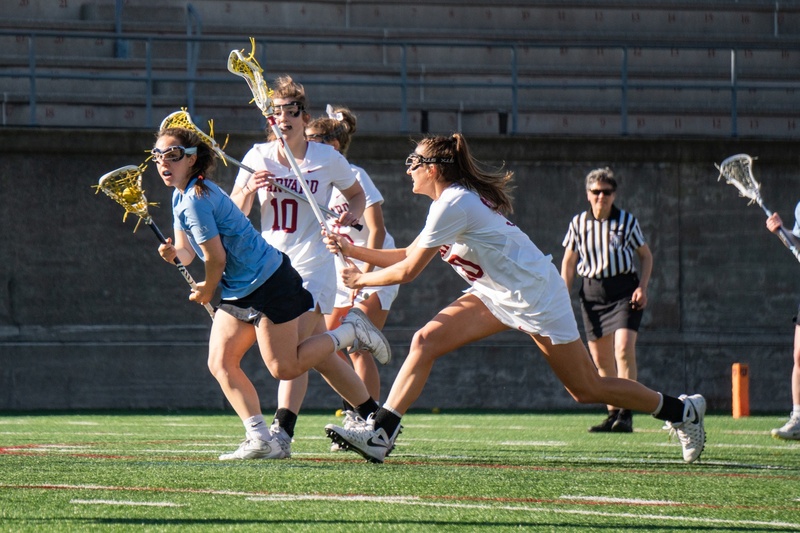 In an instance of fitting symmetry, Keating is Agnes Irwin’s all-time leading goal scorer in lacrosse and Burnetta holds the same distinction in soccer. The duo is quite close. They credit each other for providing invaluable support both in high school and at Harvard. 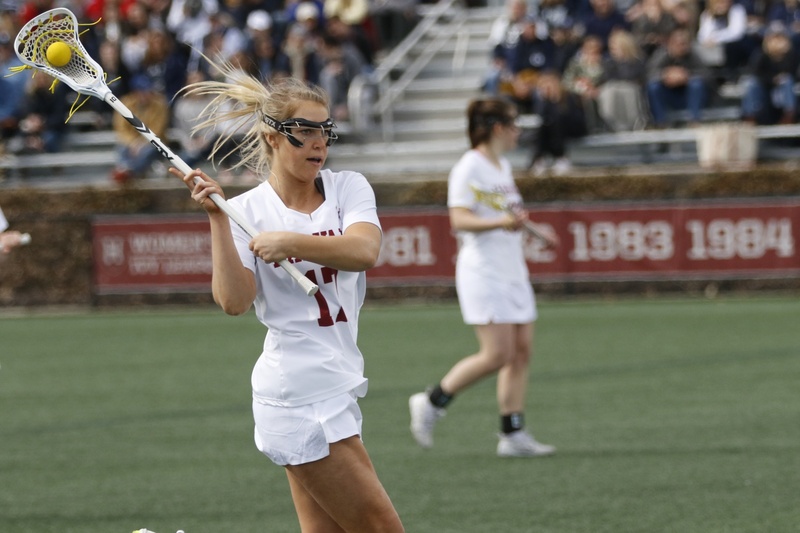 To date, junior Hannah Keating has tallied 40 goals in her Crimson career. Burnetta echoed that sentiment with a laugh. Those words are hardly empty platitudes. In her senior year of high school, Keating suffered a tough injury that threatened to put a dent in her career, and Burnetta was right there to help her work through rehab as both players transitioned into college life. “Hannah tore her ACL twice in her senior year of high school, and I feel like it was nice…” Burnetta trailed off, faltering slightly as she recollected what was certainly a difficult sequence of events. Keating, like a twin sister, picked up in the middle of the sentence. The two have clearly been through a lot together, and their connection runs deep. But that doesn’t mean Keating’s exempt from some good-natured ribbing. The Crimson is clearly a tight-knit group. With seven duos from high school linking again in college, the team’s locker room atmosphere is strong. 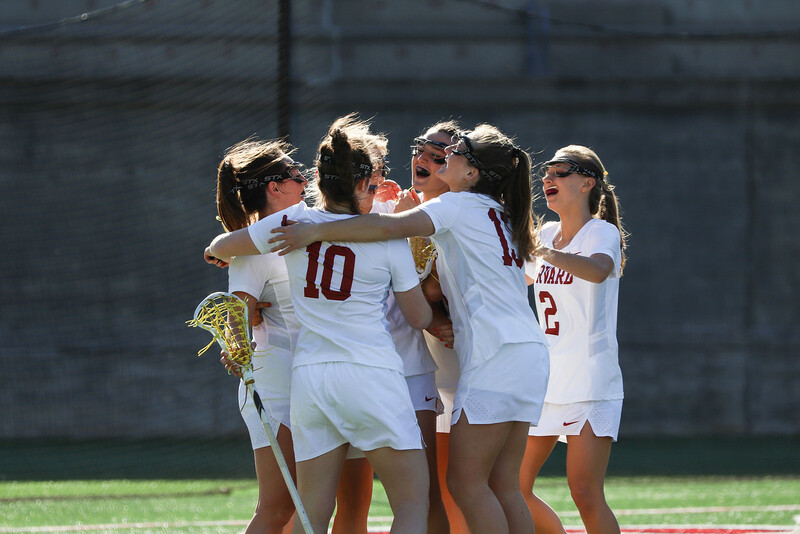 It is hardly common to have so many longstanding ties within a team, and the players’ friendships off the field have recently translated to success on it; Harvard trounced rival Yale, 18-8, in an away duel earlier this season and recently dropped a close game to No. 15 Princeton, an impressive feat for a team with a rookie coach and in a difficult conference. — Staff writer Ben Stern can be reached at benjamin.stern@thecrimson.com.